It's only natural for your garage door system to go through some wear and tear over the years. However, that's not something you have to accept. There are a lot of adjustments and repairs that can be done to greatly reduce this accumulated damage, help the mechanism experience fewer malfunction and last for a lot longer. The moving metal parts of the door can greatly benefit from this type of maintenance. The rollers and the hinges need to be lubricated every so often in order to reduce the friction-based damage that affects them. Our team will make sure that every part of your door that can benefit from being lubricated will be treated appropriately. That means the torsion springs, and the bearings as well. The tracks must not be lubricated, as that could result in an accumulation of sticky dirt, which will result in the opposite effect. In order for the door to stay balance, the torsion springs may need to be adjusted every now and then. Over time, their ability to counterbalance the weight of the door will decrease, at which point the tension could begin to slack. By letting professionals adjust these components (which you should always opt for, as opposed to trying to accomplish this task yourself) you'll be lowering the strain on them. This is the key to getting the most out of your garage door springs and ensuring their longevity. An automatic door is incredibly convenient, but it is still just a machine and it still must be checked to make sure it remains safe to use. Our experts will examine the opener's sensors and make sure their alignment is parallel and that the door reverses properly when an obstacle is detected. Regular maintenance is a key part of keeping a complex mechanismin great operating shape. 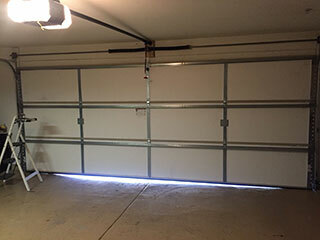 Contact Garage Door Repair Little Elm today and let our experts make sure you get the most out of your system.